Los Angeles’s surrounding mountain ranges are often overlooked in the county’s popularized image as a smog-ridden, freeway megalopolis with admired Pacific beaches. However, between the Santa Monica and San Gabriel mountain ranges, Los Angeles has plenty of rich outdoor hiking to offer newcomers and native Angelenos alike. Unfortunately many of these mountain trailheads are nestled within wilderness roads and nearly inaccessible to those without a car. The looming mountain ranges that characterize Los Angeles and provide water resources to the region are often unfamiliar to many long-time residents. The Fish Canyon falls is known for its triple-tiered waterfall canyon, a former popular vacation site now open to hikers. 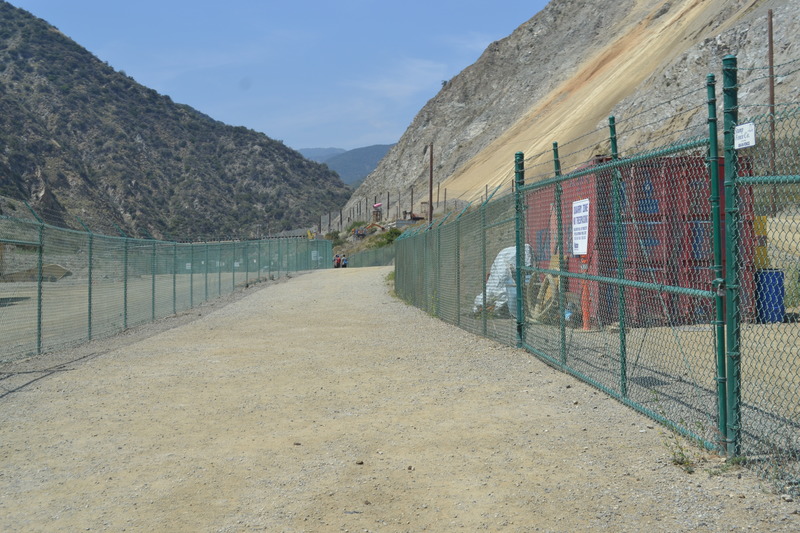 All photos: Doug Lewis/Streetsblog L.A.
Fortunately, one San Gabriel Mountains trailhead is finally accessible to car-less Angelenos eager to explore the region’s mountains. Since April, running through the end of June, a free city of Duarte shuttle takes riders from the Duarte/City of Hope Gold Line station parking lot to the historic Fish Canyon trailhead every Saturday between 7 a.m. and 6 p.m. 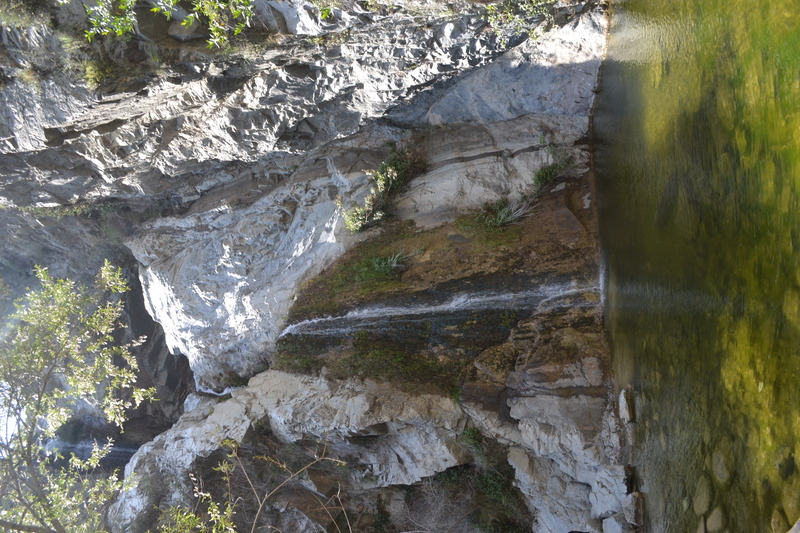 The Fish Canyon trail, a 4.8-mile round trip hike through a San Gabriel canyon, traverses a lush landscape and ends at the triple-tiered Fish Canyon falls. The shuttle runs every thirty minutes and takes around fifteen minutes one way. Shuttles depart from Duarte on the hour and half-hour, and from the trailhead on the 15- and 45-minute marks. 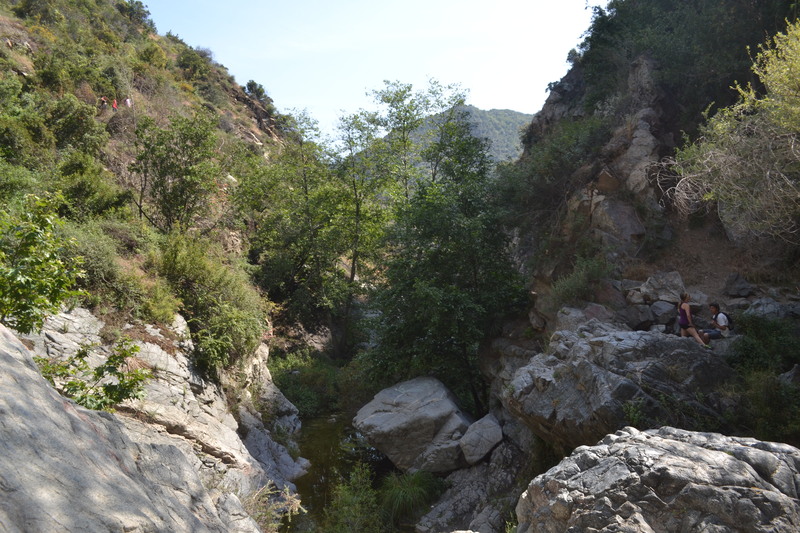 The Fish Canyon Falls shuttle was implemented by the City of Duarte, and has been promoted by the San Gabriel Mountains Forever coalition. The shuttle, financed by local-return Measure R funds, takes advantage of the newly completed Gold Line Extension to increase access to public wilderness areas for non-car-owning residents and travelers alike. Officials spoke of environmental and social justice benefits that public transit to outdoor recreation offered Angelenos. The Fish Canyon shuttle van waiting for passengers at the trailhead stop. After speaking to thousands of Angelenos, we found the number one reason people don’t visit the outdoor trailheads is the lack of accessible transportation. A lot of families in low-income urban areas have disproportionate rates of diabetes and asthma; [public transit] provides them the opportunity to access otherwise unreachable locations and connect families to healthy outdoor activity. Duarte City Councilmember and Metro boardmember John Fasana, in a phone interview, noted the local community and environmental benefits the shuttle offered by reducing trailhead car travel. Fasana mentioned the future potential outdoor transit opportunities available through the upcoming ballot measure R2, which would allow the use of flexible operational and local return funds to connect public transit to green spaces and open the San Gabriels for more Angelenos. 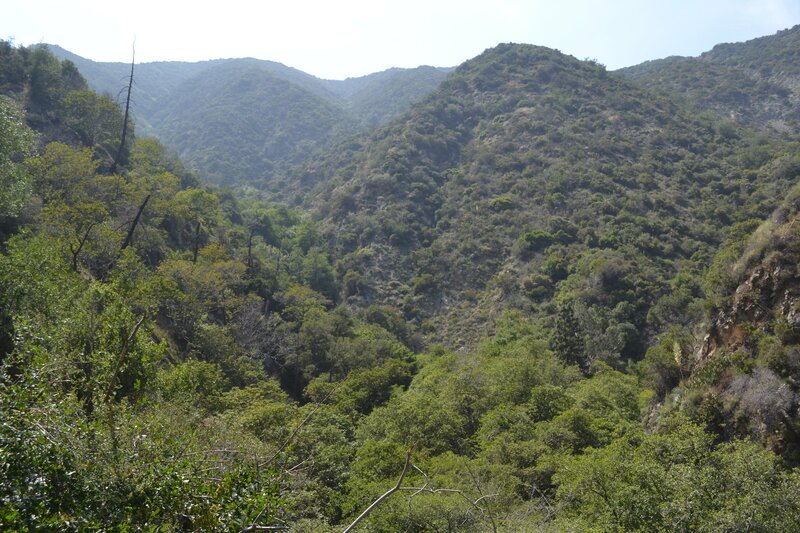 The San Gabriel Mountains and Fish Canyon trail provide a lush green landscape to explore in Los Angeles county. Fortunately, the Duarte Fish Canyon shuttle could be just the first of many transit connections to Los Angeles’s wealth of mountain ranges. With potential future funding, Los Angeles’s public transit, often mistakenly framed as a service for commuters to alleviate congestion, can provide access to affordable and environmentally friendly outdoor recreation to help create equitable, healthy communities. To car-less Angelenos, the mountains may seem a bit closer and more familiar. You can find details about the hike here and the shuttle here. See more photos of the shuttle stop and hike below. 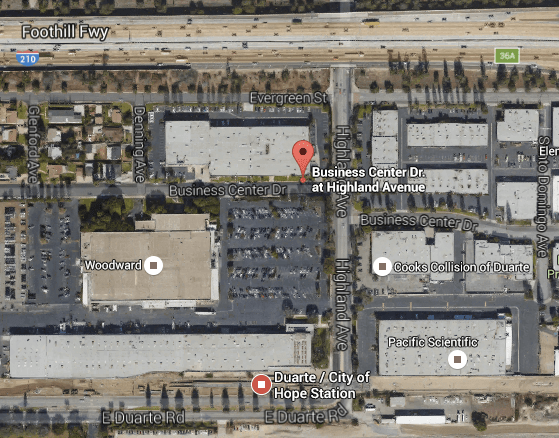 The Fish Canyon shuttle stop is located on Business Center Drive just west of Highland Avenue, a one block walk from the Metro Gold Line Duarte/City of Hope Station. Image via Google Maps. The Fish Canyon shuttle stop at the Gold Line end. The shuttle pulls up to the curb every thirty minutes on Saturdays, from 7 a.m. to 6 p.m. The ride from the Gold Line parking lot to the trailhead takes around ten to fifteen minutes. Don’t be misled by the start of the Fish Canyon hike, which wends through mining infrastructure and facilities. Lush green landscape and water are reached after about a half-mile walk. A couple of hikers enjoy the shade provided by the landscape. Also pictured is the run-off stream originating from the falls. 1. Trash the falls with their cigarette butts, beer cans, and food wrappers. 2. Bring their portable boom boxes and blast ghetto rap music in the mountain trails. 3. Graffiti rocks near these falls. 4. Bring dogs and don’t clean up after their poop. 5. Hike perpendicular across switchbacks and cause further deterioration of the slopes and trails. Nature belongs to everyone but everyone doesn’t respect nature. From my empirical observations, many low-income families TRASH these natural places. Why don’t you tell us how you really feel because the racism/classism just isn’t coming through loud and clear enough. Oh I see. So I must be white? I’m brown and a minority myself AND I’m no millionaire. So who’s racist/classist now?! This article AND YOU are the types of liberals who keep bringing up the class/race card!!! I hike the San Gabriels often and say it EXACTLY how it is!!! Who says brown folks can’t spout as much nonsense as anyone else? Not this lower-middle class brown girl. When you openly accuse low-income families of being particularly irresponsible, then you don’t get to whine about being mislabeled. Please take your foolishness to the LA Times comments section where it belongs. Whose the real fool who digs her head in the sand and ignores the reality out there?! Go to Hermit Falls or the many other trails out here. You’re not fooling nobody.